Cocktails, Chandeliers And 1920’s Chic. I do love a feather. And I especially love a feather in a bouquet. Becky’s is lovely – so many colours and textures. I very much like the cool/kooky meets 20’s fashion styling and there are some really original ideas such as a table plan on a mannequin (!) and lanterns filled with blooms as a table centrepiece. Becky’s headpiece is also something special – the art deco design works so well with her pretty red pout. 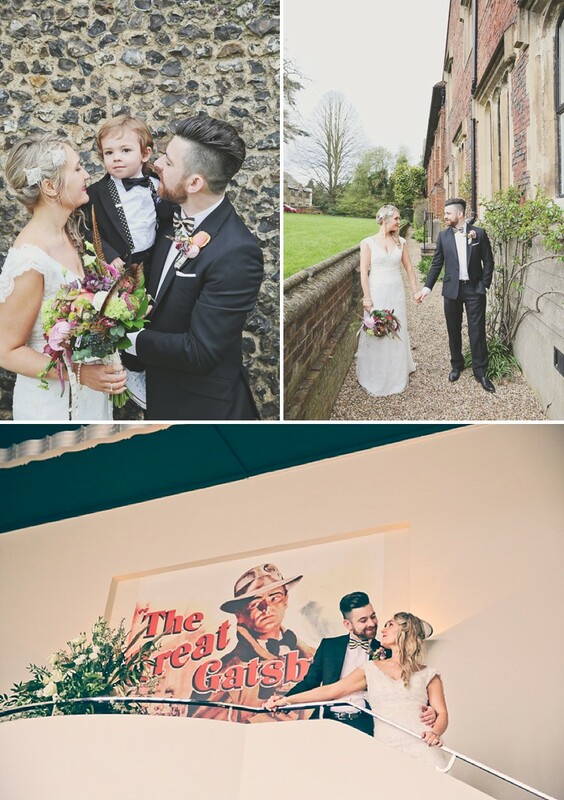 Becky and Paul are childhood sweethearts and their little boy Mason is the one of the sweetest members of a bridal party I think we’ve ever featured, you will probably want to borrow him for your own big day in fact. Cuteness overload folks. Becky The Bride Paul and I have been together now for eighteen years meeting when we were merely 16 years of age. We were set up on a blind date by my cousin Tim who worked with Paul at the time. 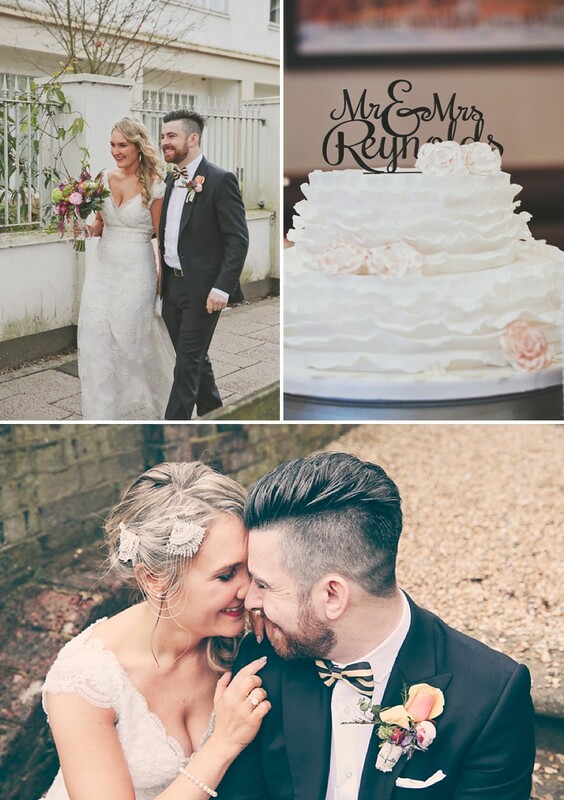 We were engaged in Brighton and stayed in a lovely art deco inspired hotel, with that and my love for the 1920’s it felt right that our wedding should have a vintage Art Deco 1920’s feel. We are best friends and soul mates and now have a 2 ½ year old boy called Mason who is our world. 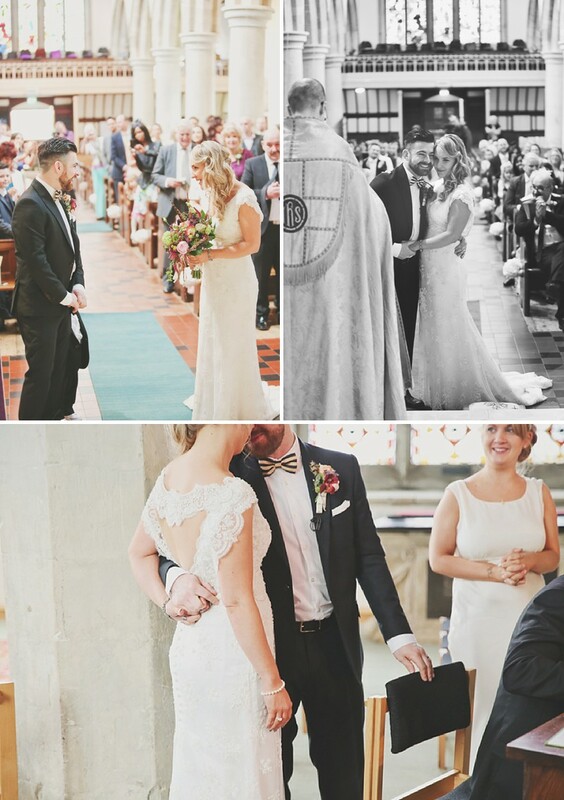 He was christened at St.Peters Church Berkhamsted and so with that special meaning it was meant to be where we got married. It was also a perfect location as we were able to skip all transport and walk from all the venues. We had two readings by two of our close friends Fay and Emma and the choir at the church. 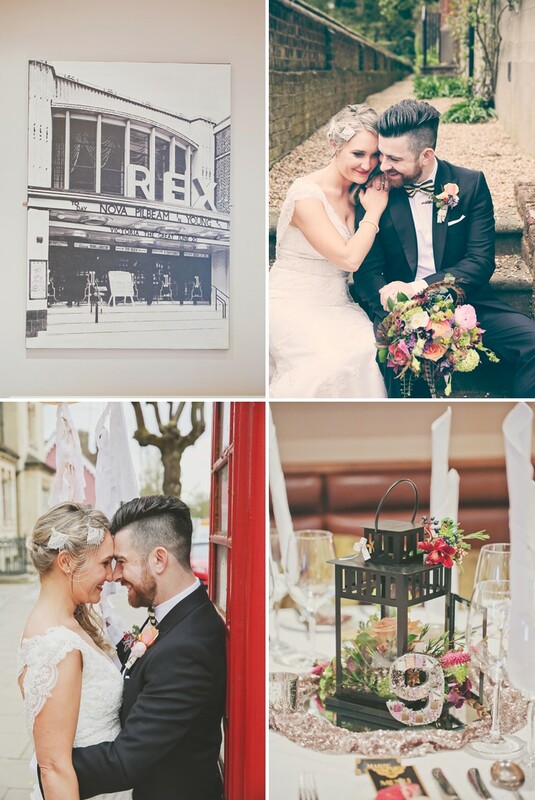 We stayed at the Kings Arms before walking to the Church and then onto our venue – The Gatsby. We have always had a liking for the odd Cocktail (!) and The Gatsby not only is a beautiful restored 1920’s cinema, it is a beautiful 5* Michelin restaurant that happens to serve the best Strawberry Bellini’s EVER!! They project vintage films onto the wall and have the most fabulous chandelier. I wanted to have lots of details that meant a lot and reflected me and Paul with what we do and all the things we love. For instance tape measure ribbon and a mannequin table plan to reflect my job as a designer, whist small clocks on tables was a nod to Paul’s job in Watches. 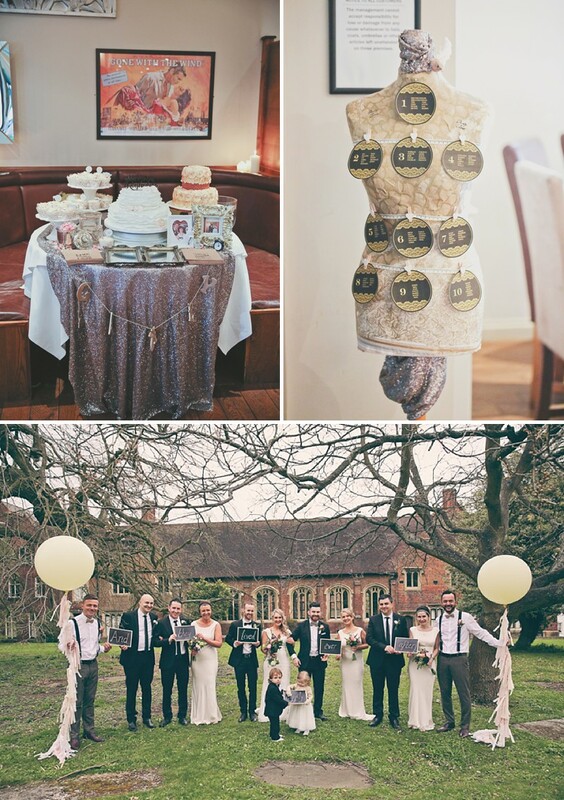 We created all of the décor ourselves making all the wedding favours chocolate moustaches and lips and kids goodie bundles to keep them occupied. I wanted the colour theme to feel very glamorous so included lots of metallic, pearl, ivory, black and accents of dusted pastels in the bouquet. All the stationery was designed by myself with an art deco graphic. 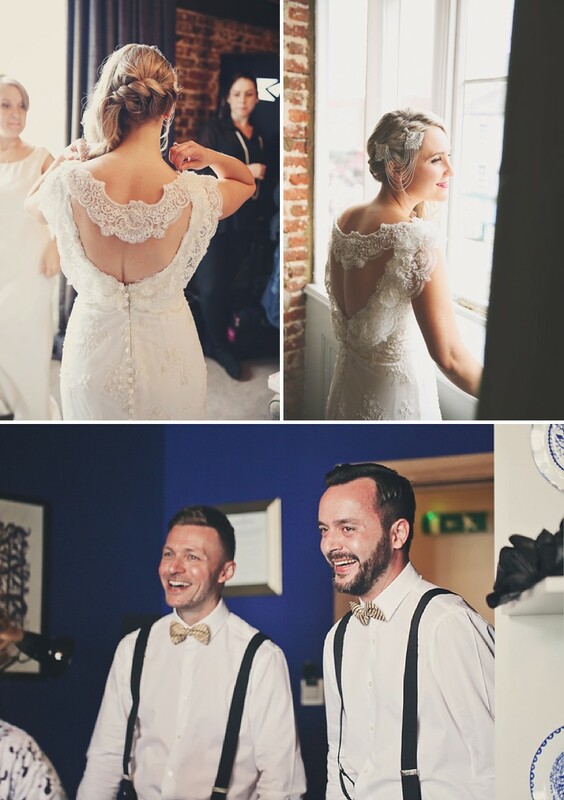 To keep with the vintage 20’s theme I chose a beaded lace dress that covered my shoulders but had a stunning back. The dress was fitted through the body and fishtailed at the hem. I always knew I would wear my hair down with some sort of head piece, but I wanted something a little different and I found what I was looking for at Emmy. Vicky Brown is a fabulous hair and makeup artist who styled the perfect fan detail headpiece that draped at the side of my hair and finished the look off with bright red lips. 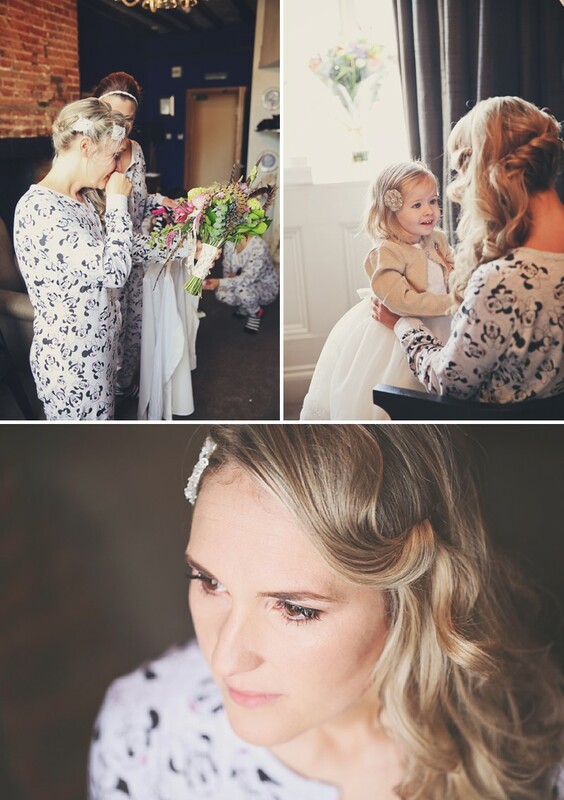 The bridesmaids wore beautiful ivory fishtailed bias cut silk dresses by Ghost that had a gorgeous draped back. 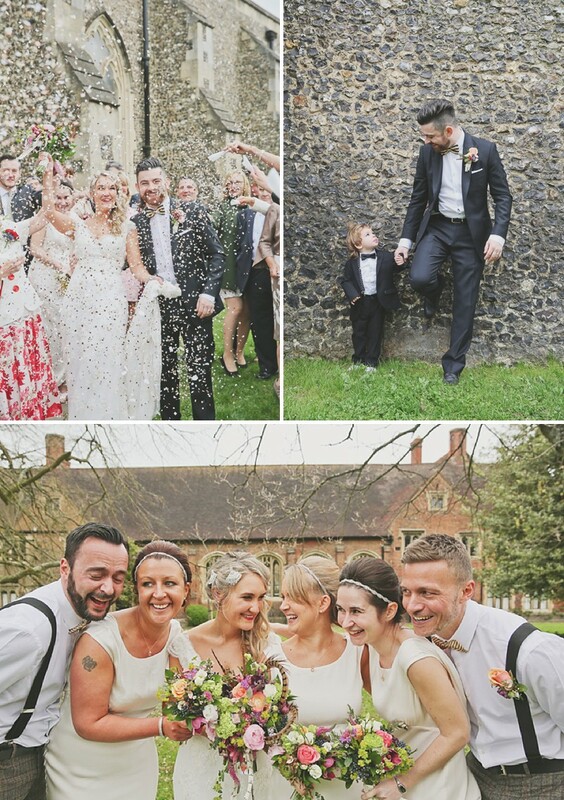 I also had two Bridesmen – my cousin Tim and his partner Tom as they are so dear to us and felt it right as Tim set us up on that blind date all these years ago. They wore Next suits and Bowties from Mrs Bowtie again with braces to give a vintage feel. My flower girl, who is my best friend’s little girl, Quinn wore a Primark dress witch I added beads to and Converse which I customised with crystals. Mason was our pageboy and wore a suit from Next along with a bowtie and braces from Etsy and Converse to match Quinn’s minus the crystals. Me, Paul and Mason our son have a very sweet tooth and Mason always calls anything sweet ‘Cakey’ and so we had to make a statement and have a CAKEY table. Mother and Me supplied the cakes and did not let us down. It was delicious with a ruffled cake finished with bronze dusting and rose decorated cupcakes. 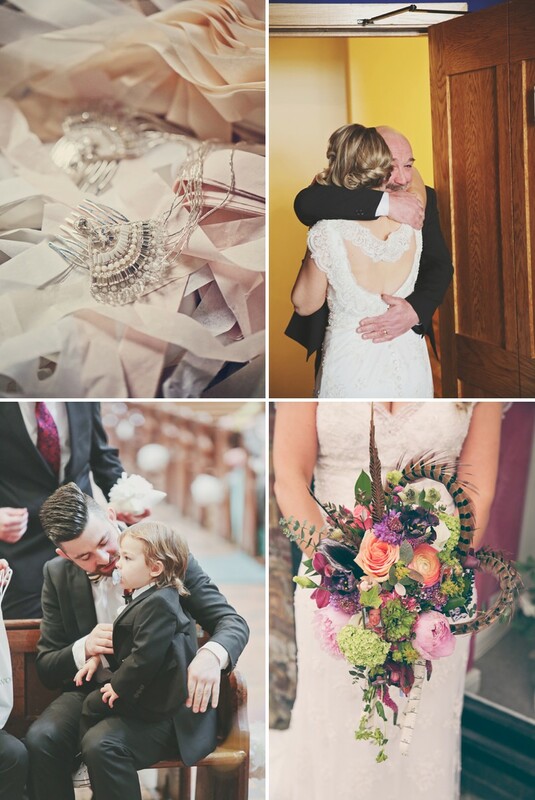 Our flowers were the highlight – Paula from DewDRoPs worked Magic with the brief we gave her. I really wanted vintage inspired flowers and she mixed exotic flowers that were popular in the 20s back with classic flowers. I always wanted length and drape to the bouquet with unique touches, I gave her tape measure ribbon, feathers and charm pictures of loved ones we had lost and she entwined these details into the arrangement making it so very personal and breathtaking. We had gorgeous sequin tablecloths on our tables and the flowers were stunning flowing from black lanterns placed in the centre of the tables. For entertainment we wanted it to feel fun but relaxed, we had a great Duet called Noah’s Ark which we found on Alive Network who played in between dinner and evening guest arriving. We then had a DJ and our close friend from the Measure’s sung our first song ‘let’s stay together’. We also had a great photo booth which was so much fun and our guests truly got involved. They were perfect for the venue as they had an aptly themed Art Deco booth which felt right at home in the Gatsby. The vintage photo booth company offered great service and props and we had a lovely guest book with all the photos in as a keepsake. We had a videographer called Minty Slippers which captured every perfect moment they take all the special moments and put it into a great highlight film to music which makes it feel so special. 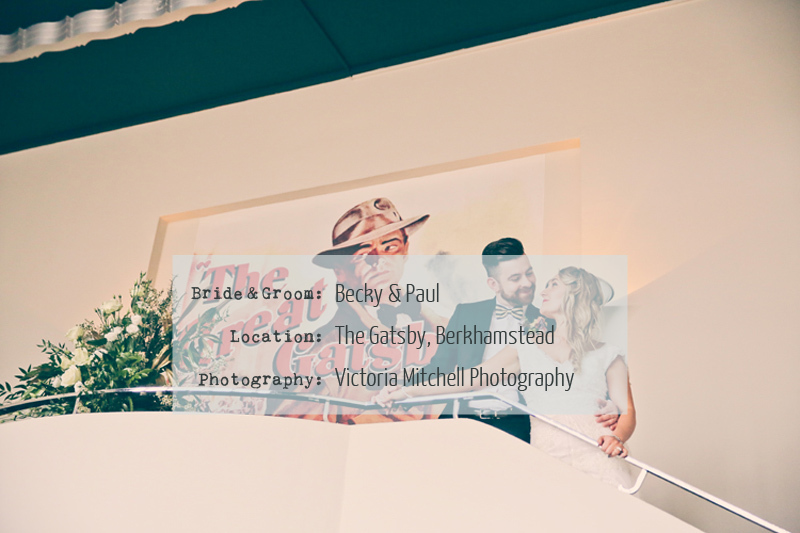 We also finally but definitely not least had a wonderful photographer Victoria from Victoria Mitchell Photography who was so friendly and personal capturing every perfect detail and moment in the day. It felt very relaxed as you can see that from the stunning pictures taken.